Under the guidance of our designers, we are able to offer Knight Templar Armour Suit to our precious clients. Our designers make this knight suit which is widely used as a show piece model in various interior decors. Excellent polishing techniques are used to give a fine finish. Apart from this, provided handcrafted suit is an impressive and notable collector item for all historic buffs. We are offering this Knight Templar suit to our customers at market leading prices. CHRISTMAS OFFER on all Re-enactment products like Armour, Sword, Helmet, Chainmail, Shields, Armour Accessories, Leather Armoury, Medieval Men’s and Women’s costumes, Latex Weapons, etc. 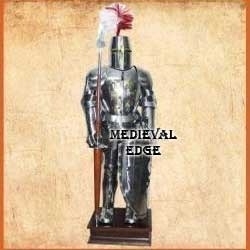 Established in the year 2004, at Noida (Uttar Pradesh, India), we “Medieval Edge” are engaged in Manufacturing, Exporting and Supplying a wide range of Chainmail Armour, Metal Sheild, Medieval Costume Helmet And Hat, Medieval Armour, Medieval Tent, Latex Sword, Medieval Men's Costume, Medieval Leather Accessories, Wooden Ship Wheel, Armour Suit and Armour Accessories. These products are Museum Quality Replicas of Ancient/Medieval (Pre-1500) Early Modern (1500-1800) items. Designed and developed by our team of highly skilled professionals using excellent quality raw material, these are Antique Militaria items of Roman, Greek, Anglo Saxon, Europe and British History. Further, these products are widely demanded for their features like perfect finish, high durability, light weight, long lasting shine and beautiful pattern. We offer these antique products in various designs and patterns to meet the varied choices of clients.